Introducing baby to his first solid foods can be far more exciting than presenting bland rice cereal in a bowl. There are a whole world of delicious fruits, vegetables, whole grains, and proteins that can be offered to baby in a safe and engaging way, no spoons and pretend airplanes necessary! Before six months of age, babies can taste small flavors of new foods on the tip of a caregiver's finger. "Flavor" means strictly that - a small taste of the juice from a solid food, like a fruit, smeared on a fingertip that baby can suckle off, or that can be dabbed on baby's tongue. By six months of age, a baby's digestive system is ready to handle small introductions of solid foods. But what foods are healthiest, that a baby is most likely to enjoy and be enticed by into trying more? To start, let your baby try new foods gradually. If baby has a negative reaction to a new food, the offending item will be easy to identify if new food introductions have been spaced out over several days. Nurse or bottle feed baby before offering new foods, as early solids are an opportunity for experimentation and fun more than they are suitable for meal replacements. Pears: Fruits that can be steamed until they are soft (including apples, peaches, apricots, and plums) and then mashed are a sweet treat for budding palates. Avocado: Rich in healthy fats, avocados are easy to mash with a fork. Plus, avocados are fun for little hands to squish - let them try these utensil free. Squash: Steamed squash of any variety, whether winter options like butternut, hubbard, or acorn, or summer squashes like zucchini can be easily steamed and mashed. They have a mild, sometimes sweet flavor, that can be made adventurous through the addition of herbs or pureed leafy greens. Grapes: Grapes and other small "finger" fruits, like berries, are delicious first foods, but be sure to slice them before presenting to babies. Round fruits (like any solid food) can present a choking hazard. Sweet Potatoes: Like squash, sweet potatoes (or yams) can be easily steamed and eaten plain or with flavor boosters like turmeric, basil, or light sweeteners. Steamed sweet potatoes are also fun for little fingers to smoosh and squish! Carrots: The most common root veggie to introduce as a first food, carrots have a naturally sweet flavor. Eggs: New research suggests that common allergies, such as eggs, nuts, fish, and soy, can be prevented through early introduction. Eggs can be hard boiled and chopped, scrambled, or mixed into an omelette and diced for baby to try. Salmon: Fish is full of healthy fats and, like eggs, brain-building omega-3's. Try mashing cooked, flaked fish for baby to try. Turnips: Give the carrots a break and let baby try a variety of healthy root vegetables, including mashed turnips, parsnips, and beets. There are a rainbow of root vegetables to try, and early introduction can help prevent turned-up noses at unfamiliar fare later. Kale: Leafy greens, including kale, spinach, arugula, frisee, and others are both fun to touch (especially the frisee), and healthy additions to a baby's expanded diet. Greens are easily assimilated into other dishes, including scrambled eggs and squash purees. Lentils: Healthy proteins like lentils cook in minutes, and can be mashed together for an easy protein boost to veggies. Sauerkraut: Want to really go out on a limb? Try fermented foods! Try sour foods! Let baby experience a full range of flavors as they learn that the world is full of delicious flavors, most of which can come straight from the produce aisle, as opposed to the boxed fare in the middle of grocery stores. Healthy eating habits begin early. 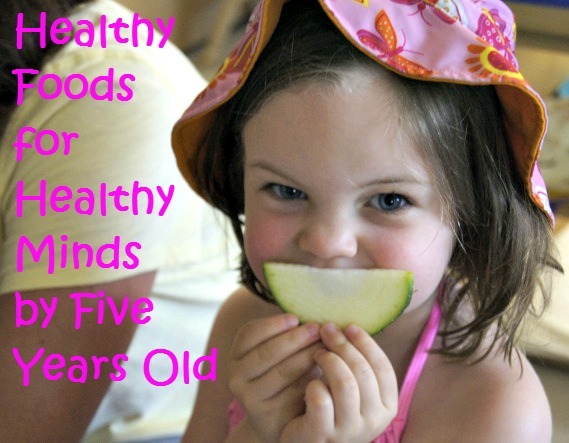 Did you know that a child's eating habits can be established as early as two years old? Or that 95% of a child's brain development occurs before age five? These are just two reasons why TLC focuses on child health and nutrition both in our preschool classrooms and our pediatric therapy services. Our two garden beds, installed by TLC alum Cooper Knight, are just one way we integrate activities related to healthy food selection, overcoming fears of new foods, cooking, the science of healthy bodies, and the science of food production. In our classrooms, students are fed healthy snacks in a nut-free, allergen-sensitive facility. Children in both classrooms and therapy sessions learn to make their own healthy snacks from fresh ingredients, many of which are grown by the children in our two on-site garden beds during the spring and summer. Poor nutrition contributes to delays in intellectual development by causing brain damage, illness, and delays of motor skill development (e.g. crawling and walking). Early shortages in nutrients can reduce cell production; later shortages can affect cell size and complexity. Nutrient deficits also affect the complex chemical processes of the brain and can lead to less efficient communication between brain cells, potentially crippling a child’s cognitive potential for life. A variety of positive food experiences and activities can help develop good eating habits and food preferences in children. TLC’s programs strive to provide these positive experiences daily, and provides opportunities for parents to gain further information on continuing healthy nutrition habits at home. Zero to Three, a program of the National Center for Infants, Toddlers, and Families, states that brain development is most sensitive to a child’s nutrition between mid-gestation and two years old. Children who are malnourished do not adequately grow physically or mentally. Their brains can be smaller than normal because of reduced dendritic growth, reduced myelination, and the production of fewer glia (supporting cells). A newborn’s brain is only about ¼ the size of an adult’s, and grows to be 80% of adult size by age three, and 90% by age five, when a preschooler graduates from TLC, making their time at TLC one of the most critical periods in their development for adequate nutrition acquisition. If you'd like to learn more about how TLC works to build healthy minds and bodies through our birth - 5 preschool classrooms and birth - 12 pediatric therapy services, contact us today at (303) 776-7417.